Nancy meets her match -- in the game of love and in the art of crime. Nancy's in Chicago to cheer the Emerson College basketball team, led by co-captain Ned Nickerson, against their archrivals. But she can't believe her eyes. Has Ned saved his slickest moves for the post-game celebration? Is he really making a pass at Denise Mason, a cheerleader who bears a striking resemblance to Nancy? The mystery takes an even more serious twist when a kidnapper, intending to abduct Denise, grabs Nancy instead! Denise's father is the curator of a museum, and a team of art smugglers are making a play for a priceless painting. 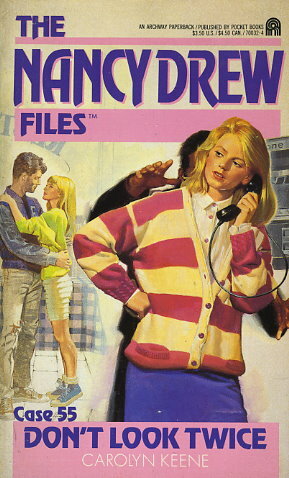 In a case of forgery and mistaken identity, Nancy discovers that deception and danger are the only rules of the game.